I wish the Yankees would put the Gerrit Cole rumors to rest. Yesterday, it was reported that the Houston Astros had interest in Cole as a possible acquisition target. Fine, let the ‘Stros pay the high price for the talented but inconsistent starter. But no, the New York Daily News had to run a story that ‘Gerrit Cole to Yankees seems inevitable’ despite the interest from Houston. For me, the ship has sailed. I was once enamored with the idea of adding Cole, but as time has passed, I see greater value with Jordan Montgomery in the starting rotation and guys like Clint Frazier and Chance Adams part of the organization. I would still like to see the Yankees create an opening for Frazier through the trade of either Brett Gardner or Jacoby Ellsbury (somebody take Ellsbury, please!) but Red Thunder can play a huge role on the 2018 Yankees if given the opportunity. The Yankees have the money to add a proven third baseman and move forward to training camp with a solid starting five of Luis Severino, Masahiro Tanaka, Sonny Gray, CC Sabathia, and Jordan Montgomery. Chance Adams, Justus Sheffield, and Albert Abreu headline the list of talented pitching prospects that can be plugged in if necessary at some point during the season but there are other arms in the organization that can help. Chad Green was told to report to training camp as a starter. He’s certainly an option (although my preference is to keep him in the 'pen), and Adam Warren is always on standby. Let’s keep any bullets for a trade to use in July when the team assesses its needs for the duration of the season without having to further deplete the great farm system that Cashman and Company have built. It’s that last sentence “…I’m going to get these guys going…” that strikes a chord with Frazier’s leadership qualities and the strong influence he plays in the clubhouse. “I would love a multi-year deal, but I am not closing the door on anything. I’m prepared for anything.” Brian Cashman, that’s a message for you. In the Post article, Frazier goes on to say “We’ve had contact with the Yankees, my agent, Brodie (Van Wagenen) has done a great job. I love playing for the Yankees. It was such a fun time for me. We just came up short. 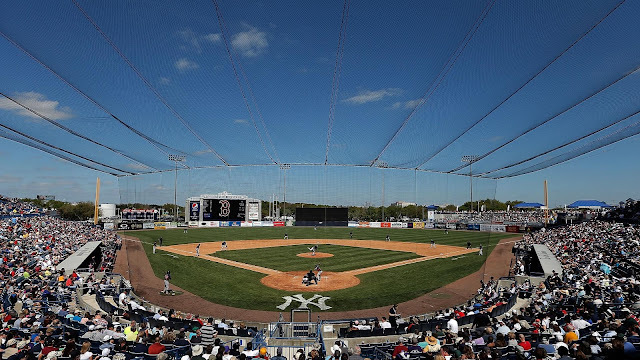 We had a really good squad, and they are going to be really good again.” Reading between the lines, he is clearly saying that he can help the Yankees get to the next level. Of course, the article also implies that Frazier would gladly join the New York Mets for the right opportunity, but clearly Frazier recognizes that this is a great time to be a New York Yankee. Can Van Wagenen and Cashman find common ground to bring the Toddfather back to the Bronx? I can't speak for others, but I would love to see it. There are no guarantees that Manny Machado will be wearing pinstripes in 2019. Josh Donaldson is on the wrong side of his prime. 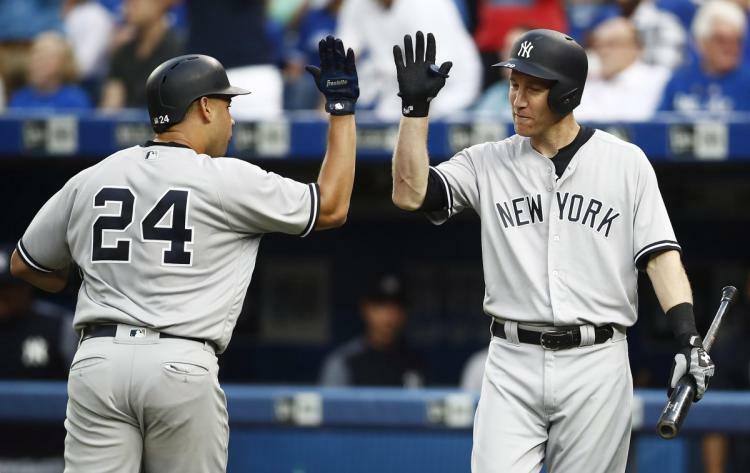 Granted, Frazier is only a year younger than Donaldson, but Frazier has shown that he can excel as a Yankee. I would really like to see what Todd could do with an entire season at Yankee Stadium. I remain hopeful that the Yankees can find a way to bring Frazier back. I’ve never been a Trenton Thunder game so I’ve never had the good fortune watch Derby, a 9-year-old Golden Retriever, in action retrieving baseball bats. Yesterday, the Yankees Family was greatly saddened to learn the news that Derby had died over the weekend from cancer. The Trenton Thunder will celebrate Derby Day on Friday, January 26th, which would have been Derby's tenth birthday. They’ll share a special tribute video and are encouraging fans to participate through social media. Derby was the son of the late Thunder Bat Dog, Chase That Golden Thunder, who passed away from cancer in 2013. Derby’s son, Rookie, began full-time bat retrieving duties for the Thunder in 2016. So, the spirit of Derby and his father Chase will live on through Rookie at Arm & Hammer Park in Trenton, NJ. Farewell, Derby. Thanks for a job well done! You’ve left a piece of yourself in the heart of the Yankees Universe. Former Scranton/Wilkes-Barre RailRiders manager Al Pedrique, now first base coach for the Oakland A’s, will see a number of familiar faces in Arizona next month. Of course, he’ll see the guys involved in the Sonny Gray trade…Dustin Fowler, Jorge Mateo and James Kaprielian. 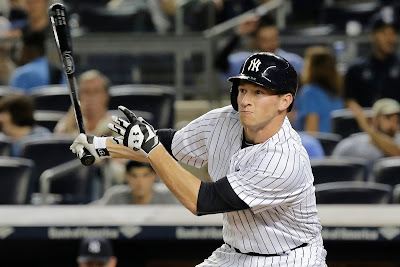 But he’ll also see former Yankees first-round pick Slade Heathcott, who signed as a minor league free agent. Heathcott spent last year in the Giants organization. 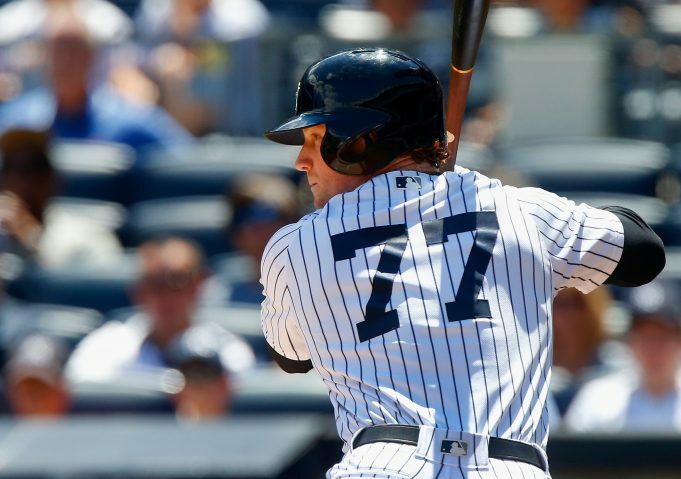 Injuries and an inability to hit with success in the upper levels of the minor leagues have plagued Heathcott, now 27. Hopefully, the clean slate in Oakland works to his advantage. Ref Cole: I believe Cashman knowshe is over-rated and he also knows what he has with his young pitchers and will not over pay for Cole. He is going to keep his best prospects especially Frazier who is insurance this year because injuries happen. Gardner, Hicks and Ellsbury are not long term. Future looks bright! 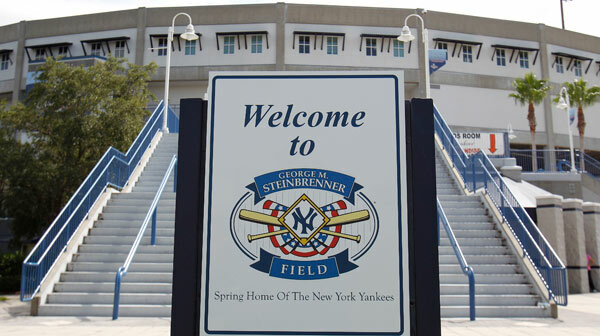 Gardner, Hicks and Ellsbury are my picks to be long gone come Spring Training. Brett, happens to be one guy I wanted in our CF spot...a long time ago. But, time moves on and so must those three players! As far as Cole goes, for get him, we have Luis Severino, Masahiro Tanaka, Sonny Gray, CC Sabathia, Jordan Montgomery...along with Green, Adams, Sheffield as starters and "Ace" Acevedo, Doming German. Must not forget Kyle Holder as a 3rd baseman, with our line-up and pitchers (about 30/40% ground balls) we need a good glove in the infield.